his family. On this long-awaited vacation, he met two people who would become very important to him: Emilie Wall, the teenage daughter of family friends and his future wife, and Friedrich Wilhelm Bessel, director of the Konigsberg observatory (figure 5.3). Bessel's work paralleled Struve's in many ways, and he would become Struve's friendly rival in the race to nail one of astronomy's toughest problems, the establishment of stellar distances by parallax. Bessel, older than Struve by about 10 years, had left school at 14, uninspired by academic subjects. He found work as a commercial accountant at a shipping company in Bremen, and there developed an interest in many practical aspects of the import/ export business. He taught himself languages, geography and navigation; eventually the problem of determining longitude at sea led him to study astronomy and mathematics. In 1804 Bessel wrote a paper showing how he had calculated and refined the orbit of Halley's comet, based on data from the comet's 1607 apparition. He then contrived to meet a leading German astronomer, Heinrich Olbers, on the street, and to raise the subject of his orbit calculation. The kindly Olbers recognized Bessel's exceptional talent in this work, and acted as Bessel's mentor until he made the transition to professional astronomer. At the age of 26, Bessel accepted the responsibility of guiding the construction of the observatory in the Baltic port city of Konigsberg (now Kaliningrad, in Russia). Bessel directed that institution for the rest of his life, while a professor of astronomy at the University of Konigsberg. According to Struve's son's biography of his father, Bessel and Struve met for the first time on Struve's trip back from Altona to Dorpat via Konigsberg. The recently completed observatory rose on one of the city's highest hilltops. Struve learned that during its construction, Bessel had embarked on some data analysis that would allow him to quantify the amount of ''bending'' or refraction that light rays exhibit as they pass through the Earth's atmosphere, a phenomenon of interest to all astronomers, and particularly those engaged in determining precise stellar positions. 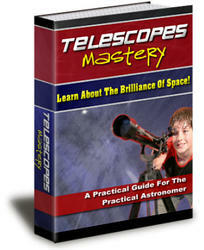 A concern for precision was, indeed, the hallmark of Bessel's perspective on astronomy. Earnest and rather uncompromising by nature, Bessel considered obtaining precise positions and orbits of celestial bodies to be the only true aim of the astronomer. 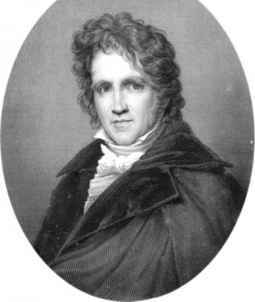 In contrast to William Herschel, who had investigated the surface of Mars and the orbits of double stars with equal enthusiasm, Bessel believed that besides positions and orbits, ''Everything else that one may learn about the objects, for example their appearance and the constitution of their surfaces, is not unworthy of attention, but is not the proper concern of astronomy. ''5 Struve was not such a purist, but in making precision observations a large part of his life's work, he may have been inspired by Bessel's zeal in that direction. 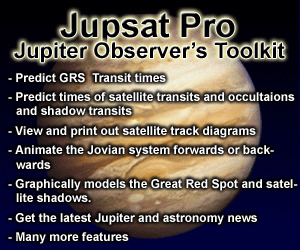 an observer has to contend with depends on the atmospheric conditions of temperature and pressure. It also depends on the height of the star or other object above the horizon, because the object's height above the horizon relates to the thickness of the atmospheric layer that the light must pass through. At the horizon, where refraction is strongest, an object often appears displaced higher in the sky than it actually is by as much as 34 arcminutes, or 2040 arcseconds. This is a large displacement, equivalent to the diameter of the full moon. The same object might not show any effect of refraction when it is at the observer's zenith. William Herschel had not worried very much about refraction in his efforts to find parallactic shifts, because he sought this shift among pairs of stars that appeared close together in the sky, and so probably experienced the same amount of distortion in their apparent positions. If, say, he had seen two stars separated by 5 arcseconds in January and 3 arcseconds in June, he might have assumed that the shift was due to the changing line of sight to the nearer star, while the more remote star appeared at rest. 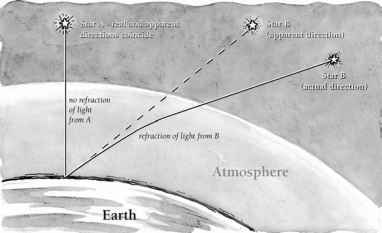 Since he was observing both stars through the same patch of atmosphere, refraction could not act differently on each one to cause an apparent change in their separation. Bessel, however, with his characteristic thoroughness, sought a complete understanding of factors affecting stellar positions and the possible evolution of those positions in time. Bessel took the lead among nineteenth-century astronomers in probing not only refraction, but also precession, nutation, and aberration. Struve's visit to Konigsberg may have encouraged him to follow in his friend's footsteps, for he began conducting his own research on these phenomena. 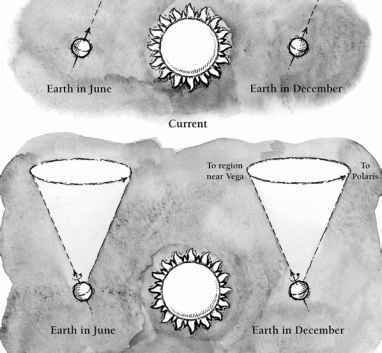 Precession is the slow gyration of the Earth's spin axis, caused by the gravitational pull of the Sun, Moon, and planets on the unevenly distributed mass of the Earth (see figure 5.5). If the Earth's spin axis were a visible line extending into space, it would currently point close to Polaris, our ''pole star'' in the north. Over a period of 26 000 years, precession causes the axis to delineate a circle in the sky, such that different stars near that circle assume the role of Earth's pole star. The star Al Deramin will do so around AD 7500, then Deneb, Vega, and Alpha Draconis at successive points around the circle. As the Earth's spin axis gyrates in space, the celestial equator necessarily rotates around too. That has implications for stellar coordinates; the zero-point or reference mark of right ascension is at the intersection of the celestial equator and the plane of the solar system, so as the celestial equator rotates, the intersection point also moves and keeps stars' coordinates on the move. Bessel worked on determining the precise rate of this precession because he wanted to compare the current positions of stars with those measured by astronomers in centuries past. Even though precession manifests itself in a cycle of about 26 000 years, a few hundred years is enough time for precession to cause a noticeable change in a star's coordinates. In fact, the coordinates of some stars are affected by as much as 50 arcseconds a year. Nutation is a "nodding" or wobbling of the Earth's spin axis and is also a result of forces on the Earth's uneven distribution of matter. Its effect on star positions is smaller than precession's — at most, a change of 10 arcseconds a year. Nutation is a more complex phenomenon than precession, and took astronomers much longer to appreciate. While precession was known to the Greeks in the second century BCE and explained by Isaac Newton in the eighteenth century, nutation wasn't even suspected until the eighteenth century. Aberration is another apparent displacement of the objects observed. It arises from the combined motion of the light-emitting object, the observer on the surface of the Earth, and the finite speed of light. An analogy for aberration on a more familiar scale can be observed from inside a car on a snowy or rainy day. When the car is in motion, falling snowflakes or raindrops appear to emanate from a point in front of the windshield, rather than up in the sky. The apparent deviation of the path of the falling snowflake or raindrop is like the apparent bending of starlight due to aberration. In 1728, the English astronomer and parallax-seeker James Bradley first demonstrated the existence of aberration in repeated observations of the star Gamma Draconis. Over the course of the year, as the Earth revolved around the Sun, the position of this ''fixed'' star appeared to trace out an ellipse in the sky, simply due to the effect of aberration. The effect is quite large; the aberration displacement amounted to about 20 arcseconds, while that star's displacement due to parallax was completely undetectable to Bradley, at 0.03 arcseconds. Struve and Bessel were among the first to understand that stellar parallaxes were likely to be very small, and that the effects of refraction, precession, nutation, and aberration would mask the stars' small parallactic shifts, unless properly accounted for. In retrospect, their patient, methodical pursuit of factors affecting stellar positions, by up to tens of arcseconds, contrasts with the hasty and overly optimistic claims of scores of early nineteenth-century astronomers who claimed to have measured stellar parallaxes. The Italian astronomer Giuseppi Piazzi, for example, the unfortunate visitor to the Herschel house who ''broke his shins'' on the telescope's framework, believed at this time that the star Vega exhibited a parallax of about 2 arcseconds, and Sirius the enormous parallax of 4 arcseconds, which would put it at a distance of only 0.8 light-years. Bessel, Struve, and other astronomers greeted these results with skepticism, but, in the early decades of the nineteenth century, could not yet offer anything better.